I was honored to be invited recently to submit a recipe for The Wine Dive challenge on 37cooks.com. The requirements: submit a recipe for an entree, which contains wine, that The Wine Dive, in West Palm Beach in Florida, might actually adapt and put on their menu. Did you see that menu? It looks fantastic. I thought about all the kinds of dishes I'd like to encounter on a menu. It's been cold and snowy here in Michigan, and I kept thinking about a succulent wine-braised beef. Something classic. Something hearty. Something wonderful. Meltingly tender short ribs of beef, braised in a red wine reduction, served with champ** (or garlic smashed potatoes) and green beans. It was quite a hit with my family! The beef was tender, without any of the stringiness that you might think of from pot roast or other braises. The sauce - oh, goodness, that sauce! - deep and luscious. I make this over two days, so that I can remove fat from both the meat and the sauce. I find that it also permits the flavors to meld well, besides being an easy dinner on the night that it is served. Combine all of the ingredients for the wine reduction in a large heavy dutch oven that will (eventually) hold the meat comfortably. Bring to a boil, then reduce the heat and simmer for 45 minutes to an hour, until the wine has reduced by at least half. Strain this, pressing down on the solids. You should have one to one and a half cups of wine reduction. Season the meat generously with salt and pepper, and dip into flour, patting off any excess. Heat canola oil in a large saute pan over high heat until it shimmers. Add the meat, fat side down, reduce the heat and brown it for 3 minutes. Turn the meat and brown all sides of all pieces. Transfer the meat to a plate or tray. Put the browned short ribs in the dutch oven. Add the wine reduction, and then enough stock to come just barely to the top of the meat - do not go deeper. Cover the pot, place it in the oven, and immediately reduce the heat to 325˚F. Braise the beef for 1 1/2 to 2 hours, until very tender. When you press on the meat, the fibers should separate, but the meat should NOT be stringy and falling apart. Chill the meat and liquid separately.Transfer the meat to a container, cool, and refrigerate. Strain the braising liquid and pour into a separate container, which should also be cooled and refrigerated. Remove the fat from the braising liquid: it will have risen to the top, and there may be quite a lot of it. Put the braising liquid in a saucepan over low heat. Take 2 tablespoons of all-purpose flour and 2 tablespoons of unsalted butter, softened, and stir them so that you have a thick paste. Thicken the braising liquid with this -- the sauce should be at a boil. Add in small bits of the beurre manie, whisking constantly, until the sauce is as thick as you wish. I like it to be able to coat a spoon but not be much stiffer than that. Taste, and adjust seasonings as necessary. 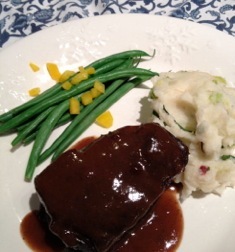 Serve the hot beef with the sauce and champ** with steamed and garnished green beans. ** CHAMP - Mashed potatoes with butter-sauteed green onions stirred in, an Irish classic, actually.